I know that it may seem like there are three months until the start of the college football season at South Carolina, but the fact is there is a little over two weeks separating us against our first game of the season against UNC in Charlotte. One very important question looms; Who is our starting Quarterback? After the most recent scrimmage at Williams Brice Stadium, Spurrier has said that no quarterback really stood out and most of the media quickly and openly agreed. But, everyone seems quick to point out that Mitch looked good at times and a lot of his incompletions were due to drops and that the stats don’t tell the full story. I was at the spring game and at the last scrimmage and I disagree. 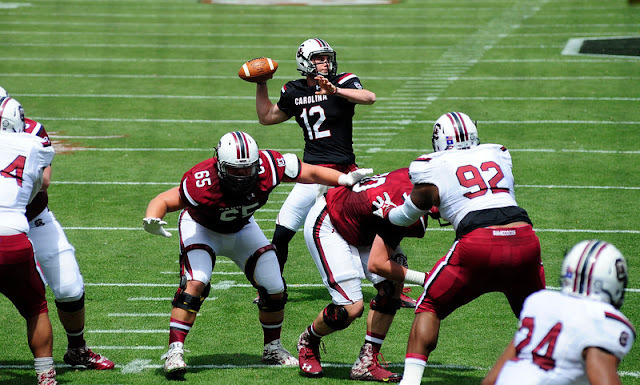 Michael Scarnecchia deserves to be in the conversation on which quarterback will lead the Gamecocks in 2015. Did Scarnecchia dominate this past scrimmage to solidify himself as the runaway leader to be the starting QB in 2015? Of course not. But, he does deserve a shot and deserves to be in the conversation on who should start. He has been consistently good during scrimmages and practices and has shown all of the signs that he can be a starting quarterback at South Carolina. He has quietly stood out among the other quarterbacks. I really could care less about stats. Although, Scarnecchia also has the stats to back up my claim. In the spring game he was 10-12 for 162 yards, yesterday he was 11-14 for 81 yards. I realize that there are many factors that tie into a somewhat meaningless scrimmage or spring game. Which string defense or offense is in during the time and a host of other things help decide how well or bad a QB does during scrimmages or practices. I really like to look at more of fundamentals and other intangibles when I look at the quarterback position. I pay attention to little things, during each snap, I watch their head and feet closely. Does he go through his progression of reads? Does he look off defenders before he finds his target? Does he give the play time to develop? Does he have a quick release and get the ball out quick enough? Does he get rattled when the defense brings pressure? Does the offense have an overall different feel when he’s in the game? Can he be a leader, does he garner the respect of those around him? When I watch Scarnecchia during these scrimmages, I notice that he goes through multiple reads and he stands tall in the pocket. Yes, he checked down to his tight end multiple times during this past scrimmage but, that was after he made his progression of reads. He doesn’t just read once and then immediately look to run or dump to his check down man. He doesn’t keep his head locked onto one side of the field giving the defense time to react. He doesn’t seem flustered or nervous at the sign of defensive pressure or crowd presence. There is obviously a lot that he didn’t do correctly, he missed a few open receivers including a wide open slant route for a would be touchdown. But, that will improve with increased repetition and chemistry with his receiving core. I know it’s extremely popular to lean towards the more stars or the more highly touted recruit when determining who should be a starting quarterback, but sometimes that isn’t always the case. Haven’t we learned this lesson already? Connor Shaw, the most winningest quarterback in South Carolina history was a three star. Dylan Thompson just had statistically the greatest season as a quarterback in Gamecock history and he was a two star. So, why is it so hard to think that a guy who wasn’t as a highly recruited could possibly be better? I guess it is a lot easier to ride a popular opinion than it is to form an opinion that doesn’t fit the narrative. I guess people just don't want to be wrong. Maybe his name just too hard to pronounce and just isn't familiar enough. I really haven't heard any compelling argument on the current quarterback situation at USC. Most of the opinions that I read on message boards and social media are based upon the opinion of other online articles or hear say. What do you say, what do you see? So, if I'm completely wrong, I leave you with two simple questions. Why should Connor Mitch start? Why shouldn’t Michael Scarnecchia start?